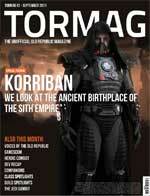 Last night while browsing through my #SWTOR list on twitter I saw an announcement that issue #2 of TORMAG was out and clicked through, expecting to see a blog ‘zine. What I saw instead is a very impressive fan publication. The 25-page PDF is designed like a gaming magazine, making liberal use of images and serving up a cover story on Korriban, the ancient birthplace of the Sith empire. Other articles include an overview of companions (including a great screenshot of a smuggler and his wookie companion), interviews with a couple of SWTOR guild leaders, bounty hunter and trooper class spotlights, and a multi-page comic, The Jedi Gambit. I love that Star Wars: The Old Republic, even without a release date, is inspiring fan created content of this caliber. Keep up the great work!